SARGODHA: A Chinese man flew all the way from his country to marry a woman in Pakistan whom he was introduced to on social media. 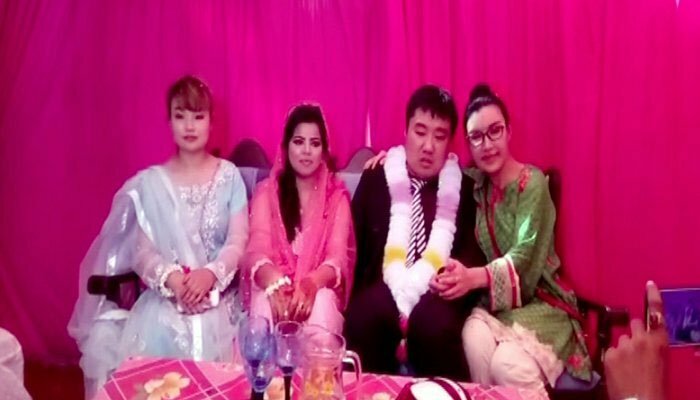 Twenty-six-year-old Budio from China and 21-year-old Shamaa from Pakistan’s Sargodha city tied the knot Sunday evening in an exciting and fun-filled a ceremony. The joota chupai also took place which left the guests from China perplexed, when the bride’s family demanded Pakistani currency instead of the Chinese Yuan they were offered. While Shamaa enjoyed her wedding to the fullest, Budio seemed uneasy with all the garlands he was made to wear in the sweltering evening. The couple flew from Sargodha to Islamabad, from where they will leave for China to start their new life.